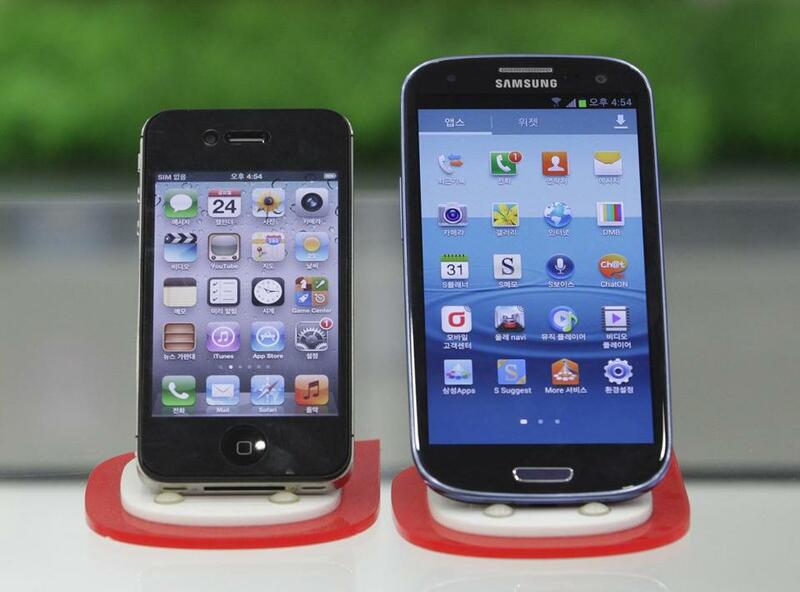 Apple’s suit contends Samsung’s Galaxy phone (right) copies iPhone technology. A California jury awarded Apple Inc. $1.05 billion and a sweeping victory in its patent infringement suit against South Korean electronics maker Samsung Electronics Co. on Friday, a decision that could make it harder for competitors to challenge the iPhone and iPad in the massive global market for smartphones and tablet computers. After a three-week federal trial in San Jose — just 10 miles from Apple’s Silicon Valley headquarters — a jury of seven men and two women found that Samsung infringed six of the seven Apple patents at the heart of the suit. They included designs for some of the user-friendly features that have made smart devices so popular, including the “bounce” users see when scrolling a list and reaching the end, and the “pinch” used to shrink or expand images on a touchscreen. For Samsung alone, the stakes are huge. Samsung has sold 22.7 million smartphones and tablets that Apple claimed use its technology, according to Apple attorney Harold McElhinny, who said those devices have accounted for $8.16 billion in sales since June 2010. Apple is pursuing additional legal action, challenging more recent products from Samsung. There are some 50 lawsuits over technology rights among companies jockeying for position in the growing $219 billion market for smartphones and computer tablets. Although the $1.05 billion in damages awarded to Apple is one of the largest penalties in an intellectual property case, it fell short of the $2.5 billion Apple contended that Samsung should pay for copying its iPhone and iPad technology. The jury also denied a Samsung claim that Apple had copied some of its designs, and denied a Samsung request that Apple pay a penalty of $399 million. Samsung and Apple are the world’s two largest makers of the high-end, hand-held devices that blend the functions of a phone with a computer. Together they control nearly half of the worldwide market for smartphones. Apple extended the iPad’s dominance in tablet computers in the second quarter, shipping nearly 7 out of every 10 tablets, according to research firm IHS iSuppli in El Segundo, Calif. The patent fight dates to 2010, when Samsung released its Galaxy line of smartphones. Steve Jobs, the cofounder of Apple who died Oct. 5, contacted Samsung over his concerns that the phones copied the iPhone, according to trial testimony. The allegations over intellectual property contrast with the commercial ties that bind the two companies. Apple is Samsung’s biggest customer, accounting for about 9 percent of its revenue, according to a Bloomberg analysis. The sale of Samsung chips to Apple, destined for iPhones and iPads, will be worth as much as $7.5 billion this year, a 60 percent jump from 2011, according to estimates from Gartner Inc., a researcher based in Stamford, Conn. Yet Samsung and Apple have faced each other in a number of legal battles. Apple won a US court order on June 29 blocking sales of Samsung’s Galaxy Nexus smartphone, the first to use Google Inc.’s Android 4.0 operating system. The product has remained on the market as Samsung appeals the order. In November, Samsung won a battle in an Australian court that allowed customers to buy Samsung’s rival to the iPad. On Friday, a court in Seoul ordered each company to stop selling some smartphones and tablets in South Korea and pay damages after ruling that they infringed each other’s patents. Today, Apple has a market valuation of $622 billion, higher than any other company on the planet. Apple had revenue of $39.2 billion in the second quarter of this year, compared with Samsung’s revenue of $41.4 billion for its most recent quarter. Apple’s stock closed Friday at $663.22, up just 59 cents for the day. Within an hour of the verdict, its shares had surged more than $10 in after-market trading. Michael B. Farrell of the Globe staff and Globe correspondent Dan Adams contributed to this report. Material from Globe wire services was used in this report. D.C. Denison can be reached at denison@globe.com.